In conjunction with San Jose’s Coalition for the Homeless, First San Jose Housing provides low and very low-income housing for families in this 31 unit per acre complex. 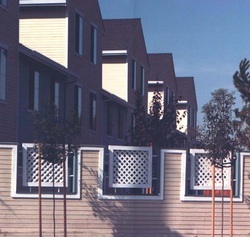 Designed to resemble a row of private ownership townhomes, the complex avoided the image of apartments to avoid neighborhood opposition. The 21 unit apartment complex uses a varied roofline to mitigate the variance on the 2-story height limit. All parking is carefully concealed in the rear and each unit has private outdoor space - either a patio or a balcony - facing south.